Being a military family, we never know where we might be uprooted next and never know how long we will be there. We grow a custom to living day to day without stability or knowing where "home" may be next. Many of us military families live in base housing or rent & let's be honest, being in a rental isn't exactly many people's idea of a 'dream home'. For us, owning a home is quite a few years away until Mr. C is out of the military and we can decide on where to settle down and plant our roots. But until then, I still want our 'rental' to feel like "home", not only for my husband and I, but for our daughter. Now having a family, priorities have changed. We may not have control over where life may take us, but I want my husband and child (and hopefully future children) to have a safe haven to come home to at the end of the day, no matter which state or what kind of home we may live in. Being in a rental has it's limitations, meaning that you have to live with the structure that you see, AS IS. Many times this means no painting or changing out any of the fixtures. Some rentals are better than others... but many are not ideal. 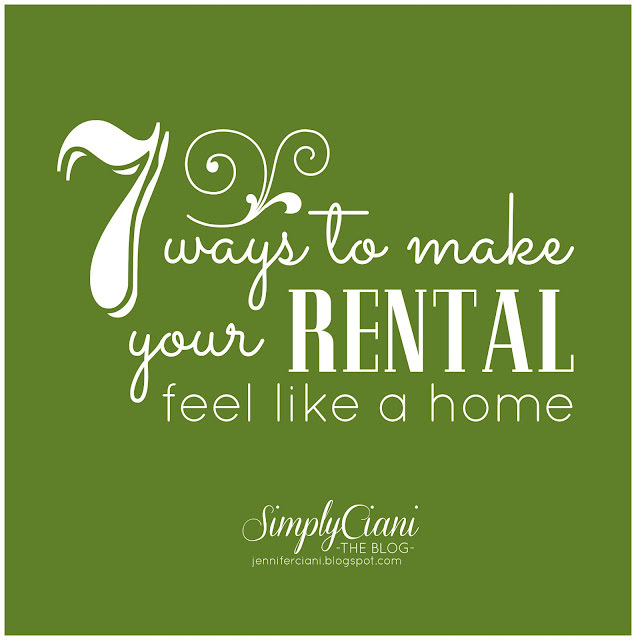 So whatever you may have to live with in your rental, work around it & make it your own! change up the decor in your home without spending a fortune! 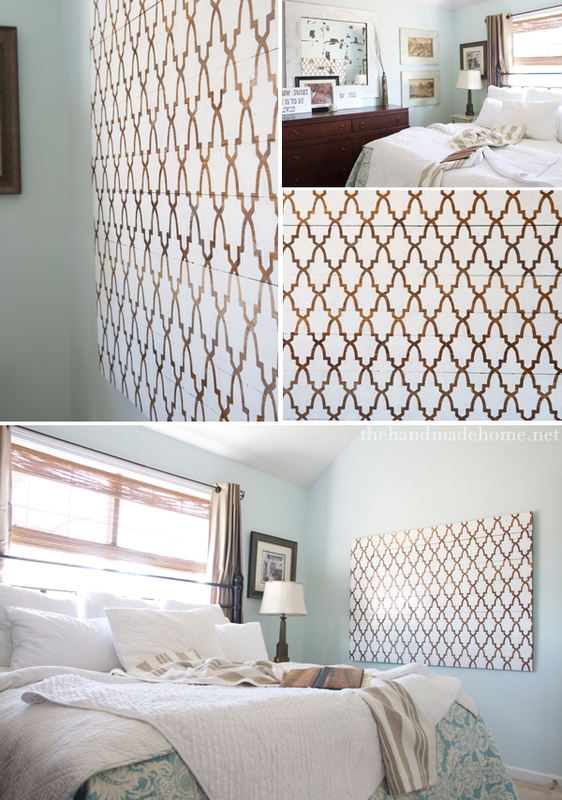 - Fabric Covered Canvas: Use a large canvas or even a piece of wood and cover with fabric. 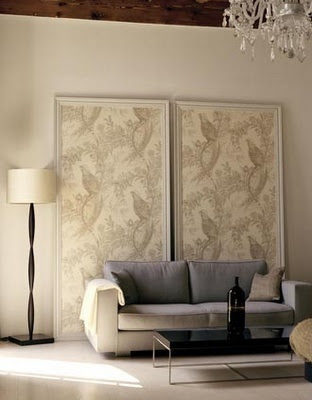 When hung on a blank white wall, it will instantly bring interest and color into your home. 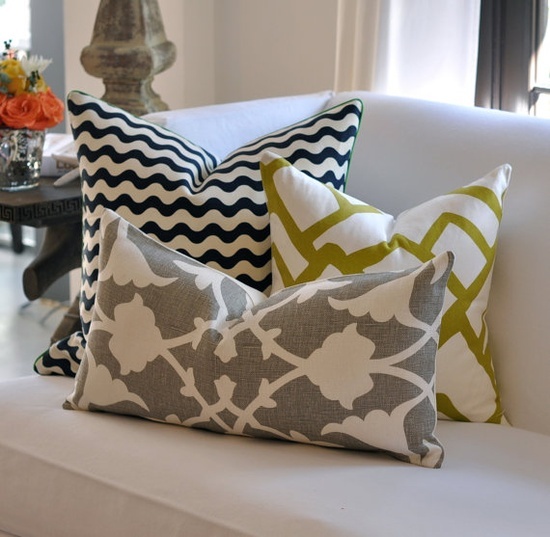 -Bring in Color with Accessories: By using pops of color in your accessories, it will tie the whole room together without using even a drop of paint on the walls! -Take down the old ugly blinds and replace with curtains: Many rentals come fully equipped with those oh so wonderful vertical blinds. Take them down! It is a quick and easy fix, just make sure to replace them back up before moving out. - Mirrors bring in light & make the space look bigger: Use a collection of various mirrors on a wall to make a small apartment or condo look larger! 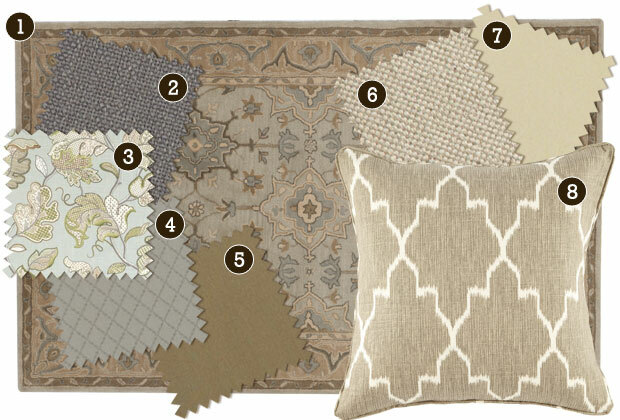 Sticking with a neutral color scheme, use a rug, or pillows of different patterns and textures to make a room come together. All of these items can make any ugly rental feel like home and can easily be switched out or taken with you to a new home. 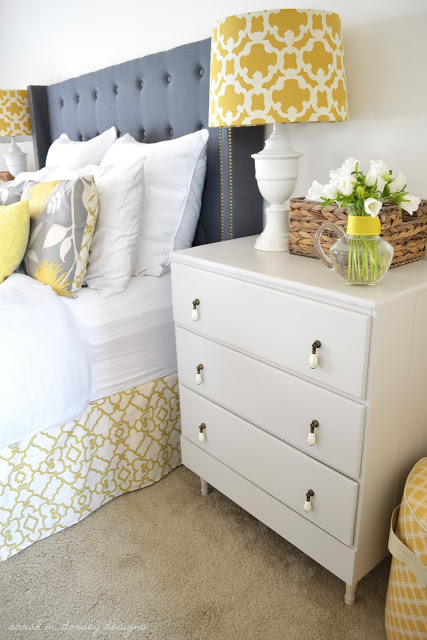 Small Spaces Need Lots of Storage! 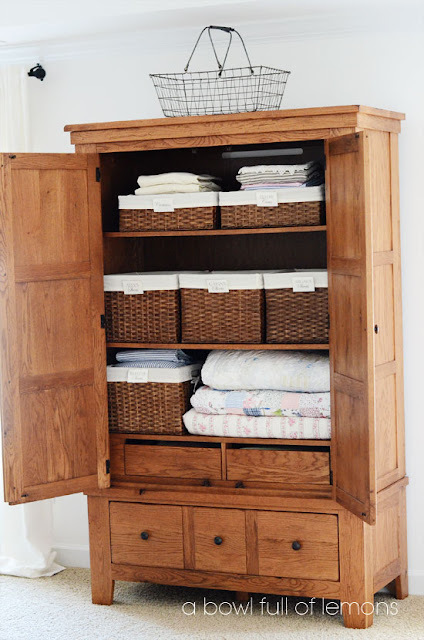 - Baskets: If you live in a small rental, you know that any storage space is a luxury! 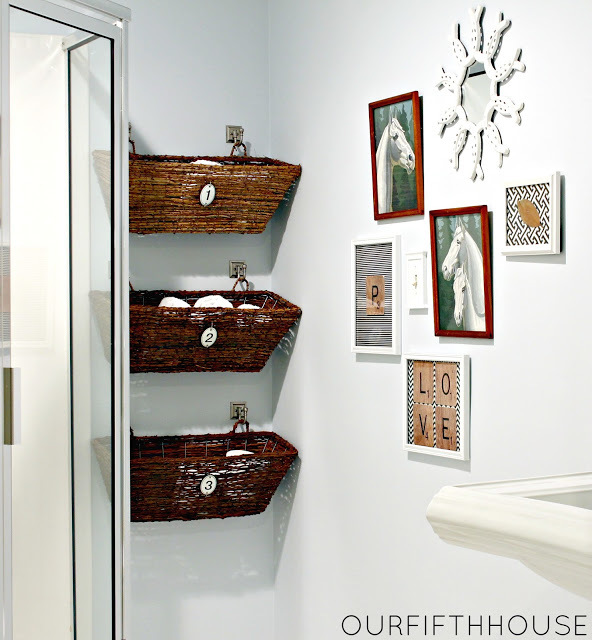 Take advantage of every wall, use hanging baskets in a bathroom if you don't have much cabinet or counter space. -Hutches: Some rentals come with minimal closet space. 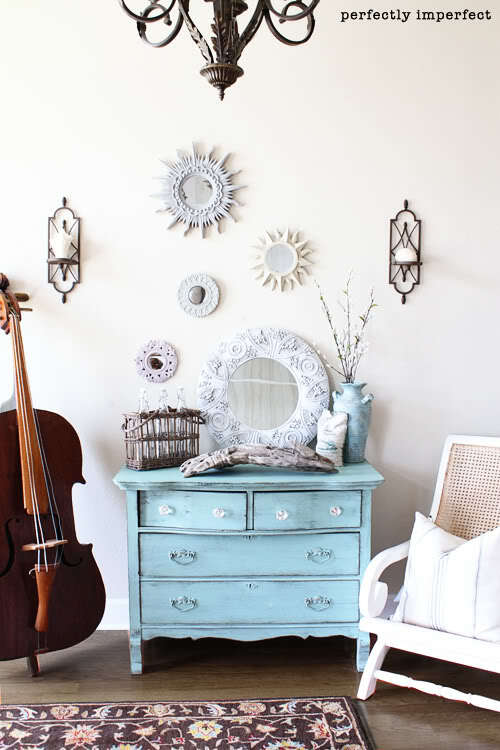 Using large pieces of furniture creatively allows for more storage options! - Add an area rug over old carpet: Rental carpets can be old, ugly and worn. 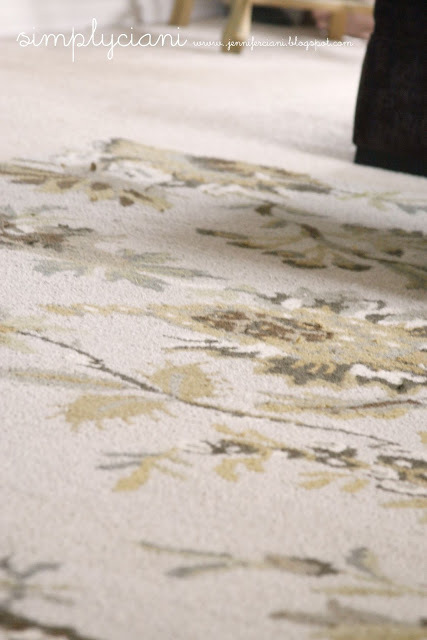 With no option to replace them, use a large area rug right over the existing carpet! - If your landlord allows, accent walls can make a huge difference! 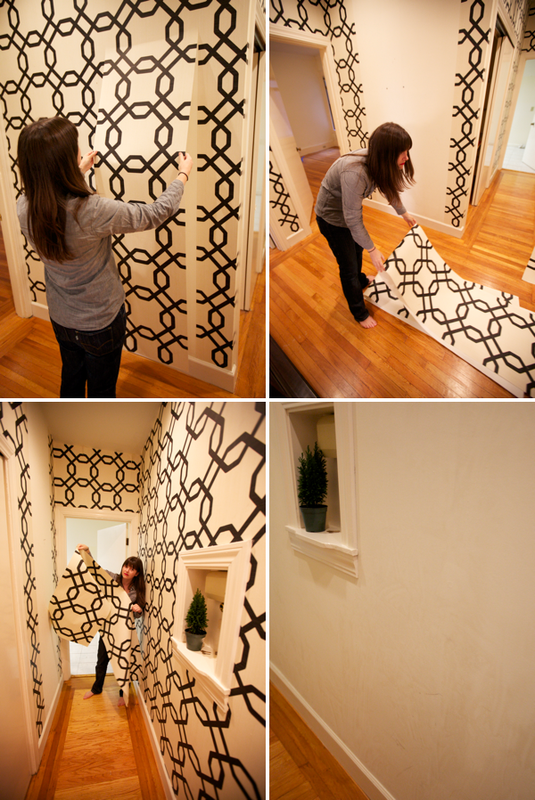 - Fabric wall decals: Follow the link below for a great tutorial on how to apply fabric straight to walls! Thank you so much! I am a Proud Army wife, so moving around is definitely familiar territory. These are some great ideas I can't wait to put to use! May God bless you and your beautiful family. 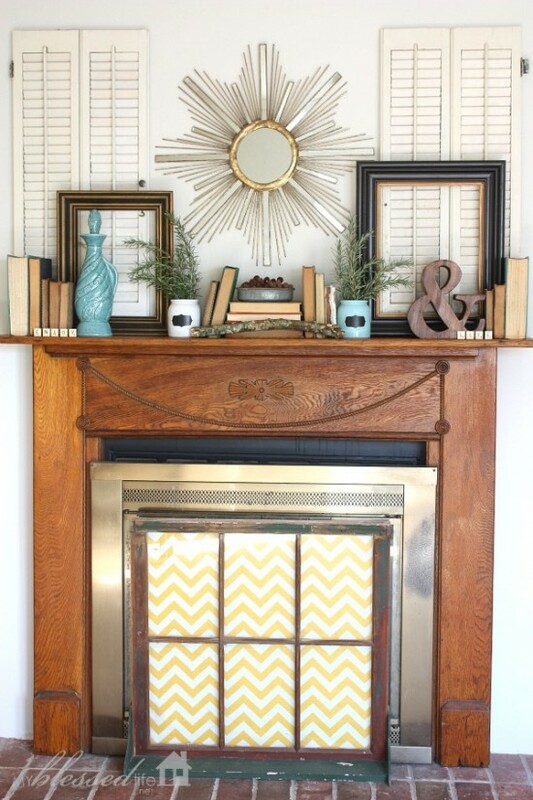 Jennifer - would love to see how you used some of these ideas in your current rental. Love you tips, Jennifer!! I'm sharing on my facebook page! These are great tips! We're in OLD base housing and it's definitely a challenge. This is great! I'm totally going to share it. I repined several ideas. I'm moving into a new rental and you gave me new inspiration! Those are wonderful tips! It's a good thing my wife does wonders in making our rental house as homey as possible. We transferred for the third time already and we have always enjoyed the adjustment period, especially the renovation process. Just treat it like it is your dream house and you'll have fun transforming it. It's comfortable to stay in a place, even if its just temporary, when you put personal touches in it. I loved reading these tips! 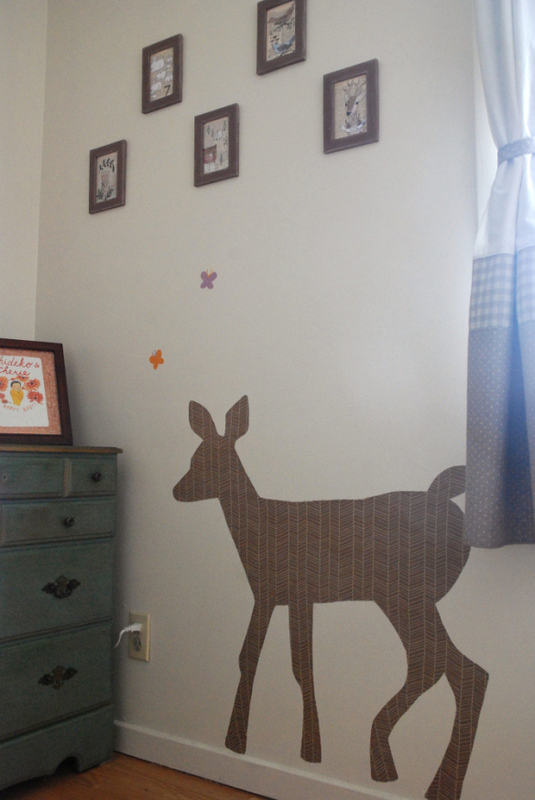 These ideas are all so cute! My husband and I are actually looking at townhouses for rent in North York, at the moment. When we find something and get settled, I will use every single one of these tips! 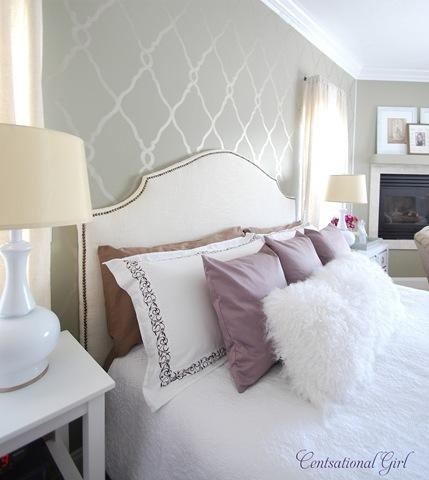 I love the painting accents in the wall to make your apartment feel like home! 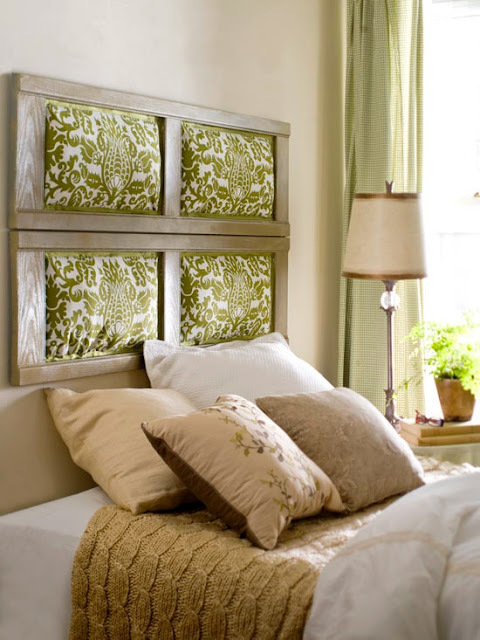 These are amazing ideas to make you feel like you belong in your apartment. I've been looking for apartments for rent. I can't wait to live in my new "home!" what are the mirror sizes ? 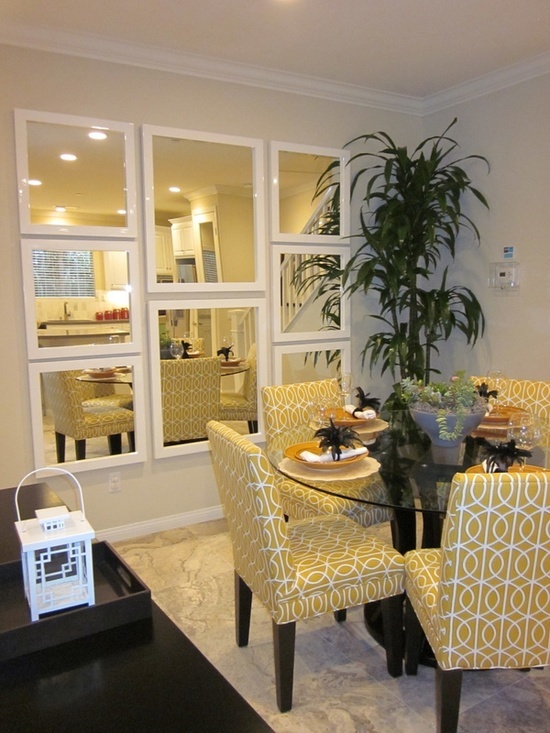 I would love to know where to purchase a glass dining room table and chairs like your own. I love the look. What size mirrors did you use? are they high gloss? Very Pretty!! Awesome blog! I gonna work on a few things! Good read!Furniture is really a important element of an office and home which add style and beauty. Simply Ciani © . Design by The Creative Rise.